This finds all *.php files that are NOT in .svn directories and sets the svn keyword property on each file. Substitute other filename extensions for the .php that you want to activate the keyword expansion on. Then commit the files and the next time you make a change it will update the $Id:$ tag. Really neat marble machines advertising some Japanese company or something. Super cool… 🙂 When I was a kid and my dad worked at a cabinet shop for a while, they had marble machine competitions. There were some really really neat marble machines, and this video shows some other ones. Check it out. KittenAuth is a new system for human-checking that forgoes all the useless random string crap that people cannot read, and replaces the whole lot with pictures of cute animals. The current 9*9 design displays 9 pictures and requires that the user clicks 3 pictures of kittens. The location of the kittens in the grid is random and to make things more fun the contents of the pictures changes too. The only real problem I see with this is that some people might not know what kittens are. Then again, maybe those same kind of people would have a hard time typing in weirdly stretched and obfuscated letters present in a typical captcha anyways. Also, this still leaves out blind users. What kind of cute audio capcha could you make to include them too? The more browser combinations that visit a particular test case – the more chance you (and the rest of the community) will have of finding what browsers do not work with your code. The friendly folk who own the uk-search-guide.co.uk and internet-guider.co.uk domains are spammers who’ve been registering on one of my WordPress Multi-User installations and creating automated splogs (spam blogs). I just deleted over 300 of their sites. They are like kudzu. I blocked them using cPanel’s IP Block manager function, but you could also do it with an Apache .htaccess file. Delete all the spam blogs that have been created. Go to Site Admin > Blogs to delete them. Delete all the users that now have no blogs associated and that have the common spammer email address. You have to kill splogs dead. This is a major issue for people who run WordPress MU installations. Check out these sweet deals on Dell Small Business servers. I just purchased the PowerEdge SC430 with an upgrade to dual 160 GB RAID-1 SATA drives for a total of $670.18, including shipping. These are the Photoshop actions that I like to use that I’ve built over the years to automate constantly repetitive actions in Photoshop. DSC_0275, originally uploaded by gserafini. 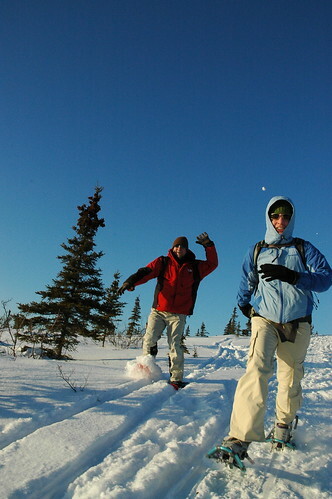 Pictures are up on the Flickr photostream of our trip to Fairbanks to visit Michael. This is one of my favorites from the trip.